Tina at Blue Moon Fiber Arts wrote back in delight: you’re a Camel fan too?! Yup. Pink Floyd meets a Jethro Tull-ish flute. Their “Never Let Go” song with its words, “Man was born with a will to survive…never let go!” was my inner theme song I kept turning to and playing in my head five years ago while I was in critical condition. It was both motivation and comfort. I had asked Tina why she’d named this colorway Lunasea, and mentioned that it was the name of a Camel song and that that was why I was interested in it. Yes, she told me, that was it. She had asked her customers to help name her new colorway, someone had volunteered that, and because she was an old fan of the band, Lunasea had totally won out. Nine days before that hospital stay started, I was in my doctor’s office in bad shape after a month’s worth of refractory Crohn’s, saying I had concert tickets for that night in Santa Cruz, an hour away, and I really, really wanted to go. But I would skip it if he told me to. Go if you want to go, he assured me. Have a good time. My friend Michelle, whom I later designed the Monterey shawl for partly as a thank you for taking me, was an old Camel fan too; her mother was a Crohn’s patient, so she was perfectly understanding of my not being sure till about 6 pm whether I was going to make it. But at the last moment, I called her and told her, oh, c’mon, let’s just go! Andy Latimer’s group had a song with lyrics that pertained to spinning and weaving, and I at one point months earlier had had a short email conversation with them on the subject. There was also an album I ordered where they had accidentally duplicated an earlier order instead, and I wondered how on earth to return it when the simple errand of running to buy another shipping envelope or new tape to reseal the original package was, just then, a huge deal to me, since I was ill. In the end, I simply re-ordered the one I wanted and told them, I grew up in an artistic household, I’m a little protective of artists, I’ll just give the extra copy to Michelle and everybody’s happy. Don’t sweat it. That evening, watching them from right near the front, they hadn’t toured in some time, and Andy looked a little out of breath a few times as he played. I thought, it must be tough to keep on rocking on stage as you age. But they clearly had a good time, they played numerous encores to a packed, cheering crowd at The Catalyst, and a fine evening was had by all. Since this was the kick-off concert to their tour, their plan was to mingle with the crowd afterwards to celebrate. In that moment we were both entirely there for each other. Whatever may come to you. I care how you do. Be well as you go forth from now. There was an email in my inbox last fall: Andy had had, for years, a mild case of a disease that impaired his blood’s ability to take up oxygen. (OH!) It had suddenly taken a rapid turn for the worse and he was about to have a bone marrow transplant. Oh honey, don’t I know it. And so the Lunasea Silkie yarn that Tina sent me to knit up for Andy got knitted the last few days; Stitches is over, their crisis is now, it was time to get that knitting DONE. I usually wait till the recipient has gotten their surprise before I say anything. This time I’m not waiting. I know how much prayers, candles, Thinking Good Thoughts, for me it’s prayer, but whatever people feel comfortable with–I know how much of a difference it made to me back in the day. And so I pass Susan Hoover’s request along. For the man who was willing to meet me, a stranger, where I was when I was the one who was sick. Andy? If you read this? Man was born with a will to survive. Be well, friend. I finished the scarf! I decided to block it, knowing that in the damp climate it’s going to, that won’t last long, but that’s okay. The edges won’t curl quite like stockinette, but they’ll have some energy to them rather than the sedentary version I’ve created here. It’ll fit into the envelope better if it’s flat. A few years ago, I looked at my inability to be out in the sunlight and gave up and hired someone to do some work in my yard. When I looked out the window, he had started ripping out my oxalis. I ran. “But they are WEEDS!” he spluttered, glancing down the street at the neighbors’ houses, afraid, I’m sure, that they would see that he had not done his job if he left them there. What if they recognized his truck? He had a really hard time with that, but it was my house and my call and he reluctantly let it go. That oxalis patch–it’s never tried to spread, it has stayed in its own proper space for the 21 years we’ve lived here–was in full bloom and was part of what charmed me into wanting to buy this house. It stays. There’s a fellow who runs Lanai, a tiny hole-in-the-wall flower shop on the main commercial drag, surrounded by a small but delightful oasis of trees and freely blooming oxalis amongst the concrete of El Camino. Someone else likes my cheerful yellow free-bloomers, I guess. There’s space for a display case, a counter, a chair for the guy, and a fridge in back. The owner is passionate about what he does, and he’ll tell you his roses cost more, but they’re local and they last far longer than the imported ones do. These are from my Valentine’s flowers. Thank you, Richard–I love it when people support the little guy who’s trying to make a difference. Sheila Ernst (modeling her Blue Jay shawl, knitted from one strand laceweight in Lisa Souza’s Shade Garden colorway in baby alpaca and one strand light blue Baruffa merino laceweight), and her husband Michael, two of the kindest, gentlest folks you could ever hope to meet. I surprised Sheila with the shawl, and she surprised me with a shawl pin. I already had the larger one, but she thought I needed a smaller one to go with some of my finer-weight shawls. Handblown glass–they do beautiful work. The yarn is Camelspin that I bought from Beehive Wools, the booth that was next to where my hamster ball was. Beehive had a huge selection of Fleece Artist and Handmaiden yarns–it was dangerous to get too close to them. Truth be told, one of the reasons I wanted that hamster ball was because last time I was in the hospital, I was well enough to knit and to get annoyed at the ball of yarn continually leaping off the bed and running around the room as if a cat were chasing it. I tried not to trip up any doctors or nurses with it, and I was not thrilled at what it might dust off the floor for me. That ball and holder are exactly perfect. Speaking of hospitals, this is going to someone who’s stuck in one now. I couldn’t decide whether it was going to him or his wife, so I’ll let them decide. The pattern will flatten out considerably when I rinse it down, but this is my Embossed Diamonds pattern that frames this blog. Now that Stitches is over, Tina, I’m finally getting your LunaSea yarn done. The vendor laughed at my instant take on her gadget: it’s a hamster ball! And you can let it roll around on the floor for the cat to chase–don’t have a cat, myself–or you can put it in the handbaggy-type holder it comes with to hold it still so it can’t run away from you. Nifty, nifty idea for those of us who love nice round balls the way they were meant to be. Her idea seemed to be more about doing fair isle without tangling, but yeah, whatever. You use yours your way and I’ll use mine mine. The little red engine that could. Mostly. I asked my hubby if the chair would still hold a charge overnight while parked outside in the car in the cold. Okay, relative cold, low 40’s, it’s California, I know, people here don’t know from cold. Answer was, he wasn’t sure. In the parking lot this morning in Santa Clara, I thought, oh no. Every time I started up the scooter, the battery indicator flashed on red and stayed there–and yet, every time I stopped, it was full on the green. But I was too tired still from yesterday to do anything but just get on anyway and wish at it, Go chair go, and go, thank goodness, somehow, it did. I again had the time of my life visiting friends old and new, with an extra bonus: Robert showed up! I introduced him to a few friends between signing books at Pam’s Pacific Meadows booth; I told Pam this story (skip down a few paragraphs to go past the knitting pattern details in the way.) He showed me pictures of the medicine blankets the kids in his class are weaving for others; he’s teaching the next generation to give of their creativity and to think about the needs of others with their work. So many so kind people, and I got to where I found myself spelling joy backwards–and I am not dyslexic. What was my maiden name again? Oh, yeah.Â I was exhausted. Oh good. I hadn’t seen it between everybody’s legs. Thank you! I plugged it in, plunked myself on the floor, waited a few minutes, and roared off with the crowd in the line cheering. Okay, I’ve had lots of wheelchairs-at-Stitches stories, but I have never had a chair have a clapping, rah-rah-go get’em cheering section before. Too funny. Thanks, y’all. I will be signing again at Lisa Souza’s booth at 11 am. Which is exactly what I did as I wrote last night; it was late and I was cheerfully exhausted. I had such a good time at Stitches! Kevin at Wagtail Farms in Australia and I emailed back and forth a bit in the last week or two; I had that Julia shawl I’d done from a single skein of his kid mohair. Would he like me to bring it so he could display what one could accomplish with his yarn? Sure! It took a few minutes for it to really sink in. But when it did, I got to see the love in his face for his sister and for his mother as he debated out loud which of them to give it to; his mother seems to have won out (I hope I’m not causing trouble by saying that!) I can understand that; honor thy mother is half of one of God’s top ten. He tried one more time–don’t you want to come by Sunday and pick it up? Nope. He talked about offering yarn in exchange, and I was fine with that, but really, I’d already been paid. He loves his family. I got to see him glowing with that love. How many times do we let strangers in to see what really matters to us? I feel pretty privileged. How could I ask for more? Dianne’s Creatively Dyed Yarn is at booth 930, and her daughter is just as nice as she is. Go tell them I said hi. I was wondering if she’d remember me–hah. I walked up, and she dropped everything and exclaimed, “ALISON!” when she saw me, and threw her arms around me. I got her back for it, though, when I opened my bag–and she was wearing a shirt that exactly matched that scarf. She got me back, though, when I tried to pay for some really really gorgeous merino she’d dyed. Fine, be that way–I’ll knit it up and put it in the next knitting book. So there. People who don’t knit miss out on so much! Oh, and–we’re four for four (or is it five for five) on the Stitches/wheelchairs saga. We got the silly thing charged okay, and then I couldn’t get it out of the minivan. But I didn’t drop it on my foot this year. Kevin at Purlescence gave me his cell so I could plead for help if need be tomorrow. People who don’t know people who are knitters miss out on so much! Karen at Royale Hare, as she was stroking her new mohair scarf from her yarn, admitted she’d seen it on my blog and wished… Not that she would ever in a million years have told me that. But she was the perfect person for it. And I would never have thought of it if that Silkie hadn’t played hide-and-seek, so that the Fitch Mountain Frost could get a chance to leap out of my bag at me while I was searching for the Silkie. Oh, and–I told a few people that everybody seemed to be sold out of my book. My bad–Lisa Souza has a whole ‘nother case. And Pacific Meadows Alpacas had a few copies left as well. Nina Price will have some too. Phew! I was afraid we were going to have booksignings with no books left! I met Dianne, the owner of Creatively Dyed Yarn, at Stitches East in Baltimore last fall, and she was one of those people you just instantly adore–she could have been selling dried paint chips and I’d have bought some to cheer her on in her endeavors. So when I read on Ravelry that she was going to Stitches West for the first time, and taking her family on a road trip to see the country along the way, I was thrilled to know I’d get a chance to say hi to her again. That day in Baltimore last fall, I bought what were I think the very last two skeins of the 70/30 wool/seacell Sea Wool in Dianne’s stock–it had sold fast. I looked at it on Tuesday, after I finished the Silkie, and went, well, YEAH! Then the question was: do I knit the Carlsbad, then? Nah, just did. The flowers from the Kathy shawl?… Nah, a bit too variegated for the lace pattern (although, looking at this, I’m thinking maybe it wasn’t, but too late now). 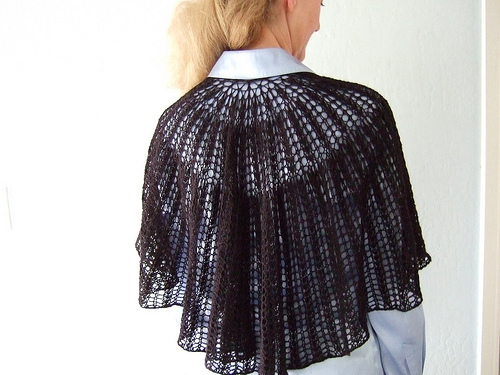 And then I decided: I did the stitch pattern from the Michelle shawl, my Sea Silk one, seaweed for seaweed. It fit. Don’t rat on me, and I’m not linking till I see her tonight. Heh. Technical stuff: cast on 27, do four repeats across of rows 14-20 with one extra plain stitch added at each side to stabilize the edges. Start early in the day. Repeat till bedtime. I’m the mom. That’s why. Alright, Silkie, naptime’s over. Wake up. Time to finish the job. Oh yeah? said the yarn. I am too. I finished up the shawl in Lisa Souza’s El Dorado heftyish kid mohair/silk, a mix of the Julia and Constance patterns that I’d been hoping I could get ready for Lisa to hang in her booth at Stitches West this weekend. Done. I had two projects in mind to try to get done quickly after that, both of them with the best of intentions. I have had a hank of Silkie balled up, waiting its turn, now was its turn, I knew exactly where I kept it, and why on earth couldn’t I find it? I spent a fair amount of time yesterday searching for the silly thing. I knew just who I wanted to knit it for and I wanted it done! While I was searching my stash, this single, rather short ball of mohair that I’d bought from Karen at Royale Hare at Stitches a year ago leaped out at me. I tried to ignore it. But it assaulted my needles, beat my inner schedule up, and dragged me into knitting my Zinnia scarf pattern out of it. The color pattern is awfully busy for that zinnia, but it absolutely refused to be anything else. Flower power rules! Yeah, my yarn bosses me around like that. What, doesn’t yours? I just wrote this, thought, but it’s GOT to be in there!, walked in the other room, opened that bag again and searched for that Silkie where I’d searched over and over yesterday, and there it sat beaming innocently up at me. The scamp. Hide and go seek. Ollie ollie in come free!